A healthy retina is necessary for good vision. The eye is composed of light-sensitive cells connected with nerve fibres that allow light entering the eye to be converted to nerve impulses that reach the brain. 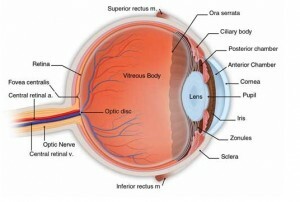 The amount of light entering is controlled by the iris and is then passed to the retina. The retina is a thin membranous lining at the back of the eye. It is light-sensitive nerve tissue that controls how images are viewed. The images are focused here and converted to electrical impulses which are carried to the brain by the optic nerve. 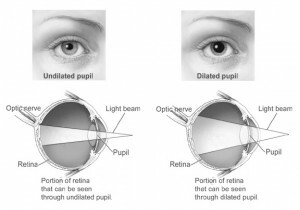 To examine the retina, an ophthalmologist will dilate your eyes during a comprehensive examination. To dilate, or widen, the eyes, drops are placed in them. A retina specialist then uses a special magnifying lenses to exam your retina. The dilation will reverse after several hours. An estimated 15 million Americans have age-related macular degeneration (AMD), but unfortunately, most won’t know they have it until they begin to suffer vision loss. AMD is the leading cause of blindness and central vision loss among adults over age 65. Learning about this disease and scheduling an examination with a retina specialist could help preserve vision for a lifetime. During normal aging, yellowish deposits, called drusen, form under the retina, which is the light-sensitive layer of tissue at the back of the eye that provides clear, sharp images. As drusen increase in size and number, they can interfere with proper functioning of the retina, damaging or killing the light-sensitive cells of the macula. Because the macula’s light-sensitive cells provide the ability to have sharp, detailed vision, the results can be blurring of central vision and a devastating impact on the ability to enjoy activities of daily life, such as reading, driving, or even recognizing the face of a friend or family member. This form of age-related macular degeneration is called dry AMD. Dry AMD can be a precursor to wet AMD. Wet AMD occurs when abnormal blood vessels behind the retina start to grow under the macula. These blood vessels often leak blood and fluid, damaging or killing light-sensitive cells—loss of vision occurs quickly. Although approximately 80 percent of patients with age-related macular degeneration have dry AMD, wet AMD is responsible for 80 to 90 percent of severe loss of vision or legal blindness associated with this disease. Can I live a normal life with AMD? 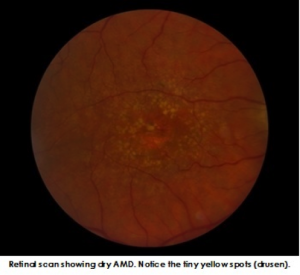 AMD may be a difficult condition, but it is not as devastating as people fear when they are diagnosed and only rarely leads to complete blindness. Millions of Americans actually live healthy, independent lives, despite having age-related macular degeneration. It is important to learn about the disease and work with a retina specialist, who will put a treatment plan in place. These physicians have the ability, training, and experience to treat all medical and surgical aspects of AMD and other diseases of the retina. A retina specialist can also direct you to a support group and suggest access to rehabilitation options, including a variety of tools and resources that can make everyday living with AMD a little bit easier. One of the most frequent causes of vision impairment in the United States and throughout the rest of the world is diabetic retinopathy. Diabetic retinopathy is a complication of diabetes that causes damage to the blood vessels of the retina—the light-sensitive tissue that lines the back part of the eye, allowing you to see fine detail. Diabetic retinopathy occurs in more than half of the people who develop diabetes. The longer someone has diabetes, and the less his or her blood sugars are controlled, the more likely the possibility that person will develop diabetic retinopathy. There are generally 2 causes of vision loss from diabetic retinopathy: diabetic macular edema and proliferative diabetic retinopathy. 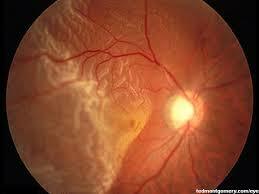 Diabetic macular edema is the term used for swelling in the central part of the retina. The macula—or center part—of the retina is used for sharp, straight-ahead vision. It is nourished by blood vessels that are weakened or begin to leak as a result of diabetes. This causes the central part of the retina to become thickened or swollen and can lead to decreased vision. Diabetes can cause damage to the small blood vessels in the retina, resulting in poor circulation to the retina. Vision may be lost because some of the retina tissue may die as a result of this inadequate blood supply. Unlike skin tissue, which might grow back if it is lost, retina tissue is like brain tissue and does not grow back once it is lost. Furthermore, the poor circulation may lead to the development of growth factors that can cause new blood vessels and scar tissue to grow on the surface of the retina. This stage of diabetic retinopathy is called proliferative diabetic retinopathy (PDR). It is referred to as “proliferative” because at this stage of the disease, new, abnormal blood vessels and scar tissue begin to grow on the surface of the retina. The vessels bleed into the middle cavity of the eye, causing vision loss because light cannot reach the retina. Scar tissue formation can also pull on the retina, detaching it from the back of the eye, resulting in vision loss. Occasionally, these blood vessels and scar tissue may grow in the front of the eye, where fluid normally exits. When the fluid cannot escape, pressure can build in the eye, creating a rare type of glaucoma (neovascular glaucoma) that can damage vision even further and cause eye pain. The macula is the region of the retina anatomically located in the centre of the retina. It is responsible for providing the sharp, central vision needed to see fine details. A macular hole is a small full-thickness retinal defect in the macula. Epiretinal membrane (also referred to as macular pucker, surface wrinkling retinopathy, or macular wrinkle) refers to the formation of a semitransparent scar tissue on the surface of the retina. With time, this scar tissue can contract and result in distortion of the underlying retina and/or macular edema (swelling). This may result in difficulty with reading and driving. The primary symptom of a macular pucker is distorted vision, but it can also result in decreased vision or loss of central vision. While most macular puckers do not affect vision and are found during a routine eye examination, about 1 in 3 macular puckers will affect vision and may require surgery. Macular holes most often result from aging and “bad luck.” Sometimes the vitreous—the gel that fills the eye—can pull on the retina, resulting in a macular hole. In other instances, a membrane (called an epiretinal membrane) can exert traction on the edges of the centre of the macula (the fovea) and result in the formation of a hole. Unlike age-related macular degeneration (AMD), there is no genetic link to macular hole formation. The same holds true when comparing this condition to diabetic retinopathy, as there is no systemic cause or environmental factor responsible for macular hole formation. In rare instances, macular holes can occur due to an injury, but most causes of macular holes remain unknown. If you develop a macular hole in one eye, there is less than a 5% risk of developing a hole in the second eye. In macular pucker, on the other hand, most cases are idiopathic, meaning there is no identifiable cause. In some instances a macular pucker can develop after a retinal tear or detachment or secondary to a variety of retinal vascular diseases (diabetes or retinal vascular occlusions). The key diagnostic test for identifying macular holes and puckers is optical coherence tomography (OCT). This technology is also very useful in educating the patient on their condition and in assessing response to treatment. Macular holes can be treated with a surgical procedure called a vitrectomy. During this procedure, the vitreous gel is removed and replaced with a bubble of gas and air. Over the course of a few days to weeks the bubble will help the macular hole close. Patients may be required to maintain a face-down position for a few days after surgery to help the gas bubble exert pressure on the hole and help it close. The gas bubble will gradually dissolve and leave the eye over a few weeks. It is important that patients with a gas bubble in their eye not fly or receive inhaled anaesthetics during the brief time they have a gas bubble in their eye, as it can result in the pressure in the eye elevating as the bubble expands. Effectiveness of surgery is on a patient-to-patient basis; however, patients who had macular holes for shorter periods of time tend to heal faster than those who had macular holes for several months or years. If a macular pucker is severe and results in loss of vision or significant macular wrinkling, the retina specialist may recommend a vitrectomy and membrane peeling, where scar tissue is peeled from the surface of the retina. Smaller macular holes can, in rare instances, heal themselves. If a macular pucker has no significant effect on vision, the retina specialist may not recommend vitrectomy and instead suggest follow-up visits to check vision and repeat OCT scans to look for any progression in the condition. There is no way to prevent a macular hole from forming or a macular pucker from occurring. 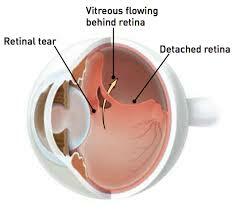 A retinal detachment occurs when the retina is lifted or pulled from its normal position in the eye. It may begin with a small tear or break that leads to a full detachment. Signs of a detachment or tear include a sudden or gradual increase in floaters or specks that float in your field of vision. It may also begin with a curtain over the field of vision. A retinal detachment can occur at any age, but it is more common in people over age 40. It affects men more than women and Whites more than African Americans. A retinal detachment is a medical emergency and should be treated as one. If not treated promptly, it can result in permanent vision loss.